BEAUTY LOOKING BACK, 2013, (diptych) pastel, charcoal, and ink on rag paper, 20 x 24.75 inches. A snow leopard looks over her shoulder, and sees a ghostlike shadow remnant of her ancestor, who is extinct. PRECARITY, 2016, pastel, ink, colour pencil and charcoal on rag paper, 22.5 x 30.25 inches. A critically endangered Amur Leopard looks out at the viewer. The leopard knows about impending death, and is hungry, in a quest for life. An unidentified primate-like animal merges with a horse and moves and tumbles. The primate is listening to a flower. A blue leopard, guided by a human hand, looks at the primate, and bites the leg of Shiva, the cosmic dancer, who performs a divine dance to destroy a weary universe. There is a hoofed leg reaching for Shiva, as well as a primate/human hand precariously balancing the dancing Shiva. GENIE, 2015, pastel, ink, colour pencil and charcoal on rag paper, 22.5 x 30.25 inches. In Genie, living animals group together in a pool of life: Genie emerges as a bird, giraffe, snow leopard, panther, and hyena, surrounded by flowers and microscopic life. The animals look at the viewer. The giraffe and the hyena listen to a flower. They want to live and thrive, but the hyena knows they are in danger. PREMONITION, 2014, (diptych) pastel, ink, and charcoal on rag paper, 20 x 24.75 inches. The leopard has a premonition, and is aware of being in grave danger. There is evidence on his hip of traces of an already extinct ancestor. 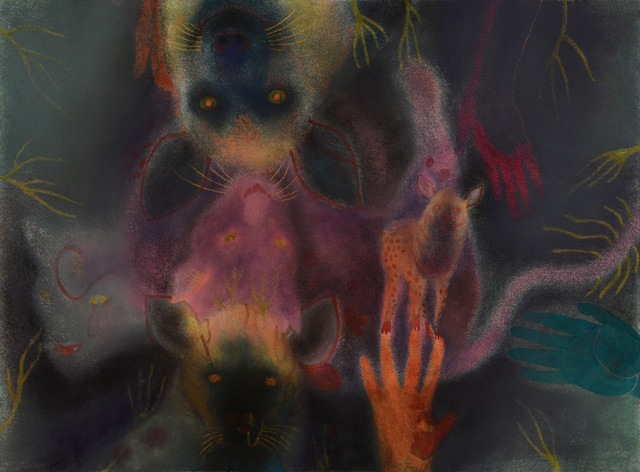 FOUNDLING, 2015, pastel, ink, colour pencil and charcoal on rag paper, 22.5 x 30.25 inches. Two large Hyenas look out at the viewer. The upside-down hyena is facing death and extinction. The Spotted Hyena, below centre, is endangered and vulnerable. Both hyenas are connected by a mountain lion and a snow leopard. Hands reach out. A human/primate hand is balancing a small spotted hyena. The small spotted hyena is the Foundling. BALANCE, 2015, pastel, ink, colour pencil and charcoal on rag paper, 22.5 x 30.25 inches. A Sifaka from Madagascar, an endangered lemur, looks out at the viewer. A form of wild cat restricted by a net, balances upside-down on the head of the lemur. 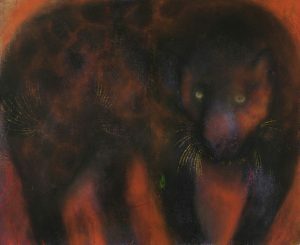 There is a dark shadow panther who merges with the wild cat. They struggle to keep balance. Hands reach out to the three animals. The hands are of various primates, some extinct. There is a human hand in the lower right corner. 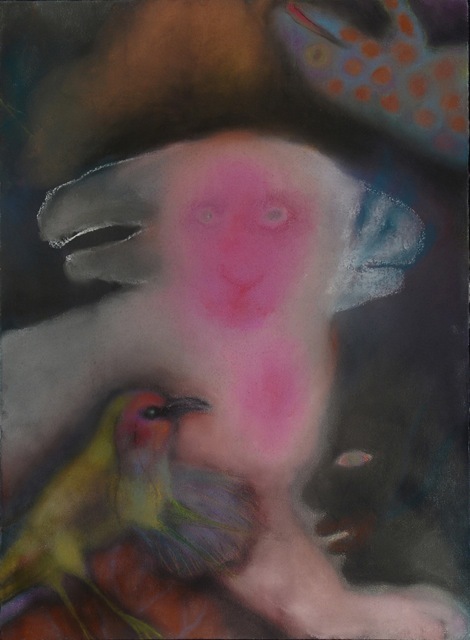 RABBIT REVERIE, 2016, pastel, ink, colour pencil, charcoal and oilstick on rag paper, 30.25 x 22.5 inches. The Riverine Rabbit is endangered, feeling trapped, and facing death and extinction. The rabbit sits in a dream world, moving his/her head back and forth, right and left, left and right. The rabbit looks out at the viewer, trying to comprehend. At the rabbit’s side is a bird, who has grown four legs. The bird is evolving. An unusual sea creature at the top right evolves into a hand. At the bottom right, a dark shadowy human figure looks at the evolving bird in wonder. “A lifelong kinship and identification with animals has helped me to express what it is to be here as a flesh and blood being. 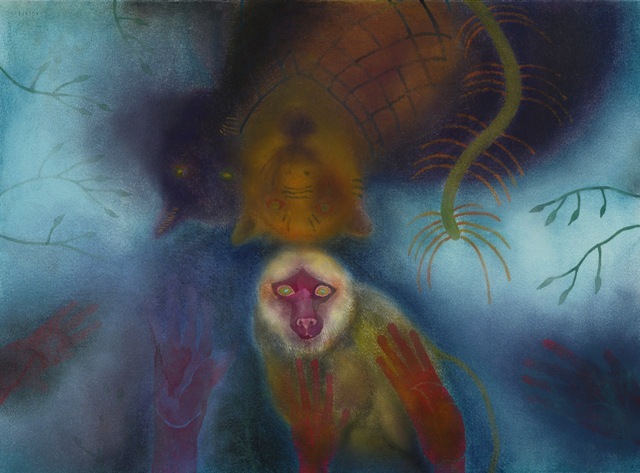 Since my earliest work in the 1980s, I have explored the interaction between the animal nature, both “wild” and “tame,” and the human psyche. Mysterious and intimate characters act within an inner landscape, similar to dreams. My paintings involve personal feelings of various states of empowerment, and express the similar states and plight of the animal nature, as the planet and its inhabitants, in the face of extinction, struggle to survive, and want to live. Since the very beginning, my art has involved a personal and universal myth, revealing the animal nature in ourselves and in the world. The animal beings are emissaries and guides. Their eyes invite us into their world. They embody an ongoing connection with the life force and the world. The myth in my art is intuitively known in my body, and is not based on recorded mythology or specific dreams. 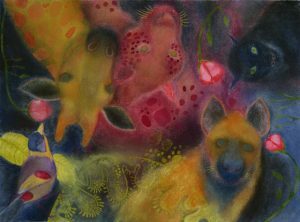 Instead of illustrating dreams, my work comes from the same place dreams do, similar to “dreamtime.” There is a connection between my body and the various beings in my art. I work on the floor, which allows my body to be closely related to the art. 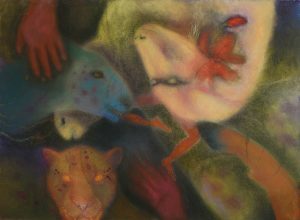 A metamorphosis occurs as I caress the surface, using pastels and ink on rag paper. 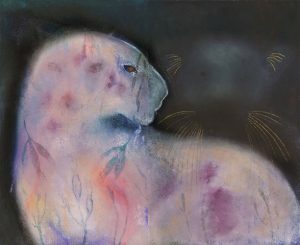 As I rub the surface with my hands, the animal beings take form, and an intimate connection emerges. In addition, since 1979 I have spoken and sung in Animal Tongues, which I often do while working, and have performed in conjunction with the visual art. ← Why don’t we grieve for extinct species?